Identity straddling can be a delicate thing in the motorcycle world. Though it didn't lack for aggressive looks, the outgoing Kawasaki Z1000 had a bite that wasn't quite as fierce as its bark. Kawasaki engineers weren't oblivious to the disconnect between appearance and performance, so when they redesigned the Z1000 for 2010 they went for a leaner, fiercer bike that was not only faster in a straight line, but nimbler in the turns and better at stopping. Welcome to the all-new, 2010 Kawasaki Z1000 (priced at $10,499), which is one of seven new-for-2010 Kawasakis. A long list of items was addressed for the Z1000's transformation. Ditching the old steel frame in favor of an aluminum unit, the new chassis and subframe enables 30% more torsional rigidity, more compact proportions, a lower seat height (dropped to 32.1 inches), and 8.8 lbs of weight savings. Total weight loss is 22 lbs, bringing curb weight to 481 lbs. Also updated is the Showa 41mm fork, which is now compression adjustable. The rear suspension is also revised, with a horizontal back-link shock. The engine, which acts as a stressed member and now meets the frame at four points (versus the previous three), has also been dramatically re-worked. Displacement was bumped from 953cc to 1,043cc, and a secondary balancer was added for smoothness, which also enabled a stiffer chassis. An all-new exhaust system includes smaller and more mass centralized mufflers (which happened to make our list of 2009's Ten Weirdest Exhausts.) Grunt has been bumped from 125 horsepower to 138 horsepower (at 9,600 rpm), and torque improved from 72.7 lb-ft to 81.1 lb-ft (at 7,800 rpm.) For comparison, the Z1000 produces the same amount of torque as the ZX-10R, at 900 fewer engine rpms. Stopping power comes via ZX-10R-like 4-piston, dual 300mm petal disc brakes up front, and a single-piston 250mm rear setup that's been spun downward to better showcase the new cast aluminum, open-spoke wheel that's wrapped in aggressive Dunlop Sportmax D210/D210F rubber. The cockpit view reveals essentially no upper body wind protection, and a small, amber-tinted instrument panel that's capable of tilting into three positions without a tool. The fully digital gauges include a speedometer, bar-style tachometer, odometer, dual trip meters, clock, and fuel gauge. Elevated handlebars enable an upright posture, though the Z1000's pegs are a bit rearward, adding an element of sportiness to the otherwise approachable ergonomics. The saddle, though thin and somewhat stiff, is still reasonably comfortable. ON THE ROAD: Edgy enough for ya? The night before our Z1000 ride, Kawasaki reps reiterated that their naked literbike has become dramatically more dynamic. Perhaps because of my inherent skepticism (or the persistent tendency of PR people to tell tall tales), I didn't quite believe this chiseled standard was as tightly wound as it looked. On a chilly Saturday morning, we set out from the small town of Cambria, California on a series of tightly coiled backroads that were slick with wet leaves and scattered with potholes and rough surfaces—not the most relaxing conditions, but a great way to test the Z1000's suspension and chassis. The first section proved challenging, especially because of the way my particular bike was setup; though the engine felt delectably strong, turn-in was skittish and the bike seemed unsettled in turns. My group's pace was lightning quick, but I couldn't wait for a break so I could have the suspension softened up a bit and ride more confidently. When we finally rolled up to our lunch stop, I had a Kawasaki technician soften the front and rear rebound settings by several clicks. Right off the bat, the difference was perceptible; with more compliance, the bike settled into leans less nervously, which in turn inspired more confidence. The Z1000 still felt crisp and willing, though given the opportunity, I would have liked to experiment with more suspension settings. Emboldened with the more forgiving setup, I tapped further into the engine's reserves, and came away pleasantly surprised by the surge from around 7,000 rpm to the 11,000 rpm redline. Though tuned for more usable midrange torque, the inline-4 is an eager revver, and the rush of power is accompanied by some vibration and an great intake howl thanks to ducts on either side of the fairing that route air into a resonator chamber in the airbox. As the day wore on, the Z1000 proved closer to an all-out sportbike than I anticipated. It was punchy, involving, and more agile than its bulk suggests, with brakes that were up to the task of undoing the speed brought on by the powerplant. Oh, and did I mention that it melts tires rather effortlessly, too? Kawasaki's injection of attitude into the Z1000 has yielded a bike that's more focused, involving, and ultimately more entertaining than its predecessor. 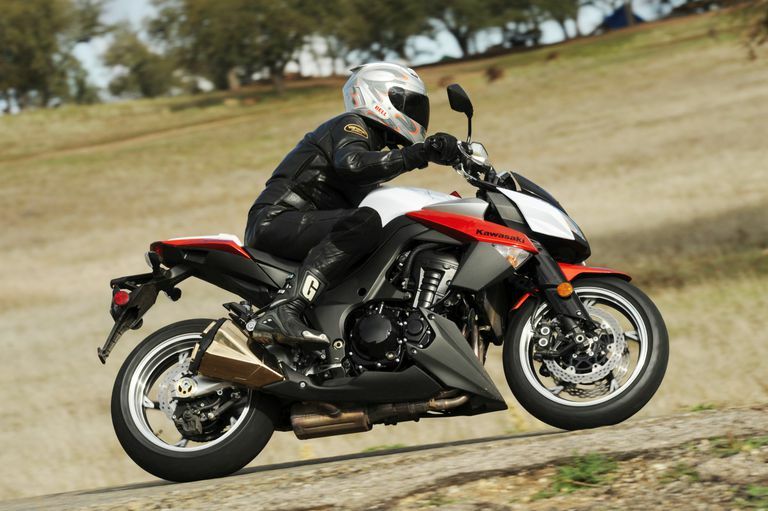 But if you're looking for an easy rider, the Z1000 may not be for you; aggressive motorcyclists will appreciate its edge, but those looking for more a mellow attitude will likely find its handling too eager and its engine too temptingly powerful. Though it offers performance that's more easily exploited on the road than on the track (in contrast to high strung stablemates like the ZX-10R), the Z1000 lacks the ability to take on saddlebags, eliminating another potential set of customers. "I think this is a bike that's going to take some time to figure out," says Kawasaki product manager Karl Edmondson. But if American riders take a chance on this sharp-edged naked bike, they'll be rewarded with a good looking motorcycle whose performance is finally as aggressive as its styling. Who should buy the 2010 Kawasaki Z1000? Recreational riders looking for near-supersport levels of performance without the committed posture and high-strung nature of an all-out sportbike.